We write about widowhood as we live it. Together we examine the good, the bad, and the ugly parts of life as a widowed person. The views expressed here are those held by each individual author. 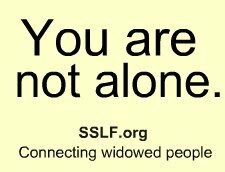 We take no credit for their brillance; we just provide them with a forum for expressing their widowed journey in words that are uniquely their own. ...... is not something I have felt a lot these past almost-6 years. I mean, I've felt it for a few things, like my children, my family and friends who were there for me when I really needed them. But it was beyond difficult to feel thankful, while at the same time not believing that Jim was dead. But this year ...... this year is different. 1. The first thought I have when I wake up every day isn't, "Jim is dead". 2. The last thought I have before I fall asleep every night isn't "Jim is dead". 3. I rarely think, "I can NOT believe that this is my life!" 4. I smile more times than I cry when I think of him. 5. The future isn't inky black for me anymore. 6. I learned who my true friends are. would happen ...... at least not for another 50 or so years. 8. My sons look very, very much like their father. 9. Pictures of him don't stop me cold and send in tsunami-like waves of grief. 10. I no longer constantly feel like I'm going to drown in those waves. 11. I no longer wish I were dead. 12. I no longer hope that I'll be hit by a bus, struck by lightening, or be in a plane crash. 13. I no longer believe that I'll never be happy again. 14. I don't fear for my children's lives every time they drive away now. 15. I don't see those looks of pity on a regular basis. 18. I don't resent old couples walking hand in hand anymore. 19. I know that Jim would be proud of me, and of his children. than most people I know. I could probably go on with this list, but I won't. If you are not at the point where you're able to feel gratefulness ...... please don't worry. Don't knock yourself for that. It doesn't mean you're ungrateful or stuck or whatever. It only means that you're normal. At three years, I'm about halfway through that list. About to host my third Thanksgiving without him. Don't remember the first - did it because everyone needed me to be okay enough to do it and I did too. The second was bittersweet - his physical absence was still profound, but I was proud of what we've built and the home we made and really felt him here with us in a different way. This year I miss him terribly, but felt comfortable preparing by myself and confident enough and strong enough to add more people to our table. New guests are excited to come - one of their children said she can't wait "Your house is so warm and comfortable...". Yes, my house is warm again. Halfway through this list is pretty darn good ...... in my opinion. I'm so glad that your house is warm again. Thank you Janine for this list, and reminding me what I currently have to be thankful for. Thank you for reminding me I have much to be thankful for. Even though I still feel that Dave & I drew the short straw in life, my outlook has improved greatly. And occasionally I still do think “I can NOT believe that this is my life!”, when everything around me feels foreign, but for the most part I recognize that I do have much to be grateful for. Thank you for taking the time to comment. And yes, #16 is mostly insane. I guess I hated the fact that Jim wasn't here to ride his bike, so no one else should, either. Maybe. Who knows? Grief is such a strange being. I'm glad that you could relate to some of the items on my list. And that you had Dave ...... for as long (albeit short) as you did. Thank you. Thankfulness is hard,esp when others are quick to remind us of all that we "should" be thankful for!! "It could be so much worse..." NO NOT REALLY! All that aside, I too will be cognizant of that which I am thankful for and if my list is only to 10 instead of 20, thats okay; or even if there is only 1 thing on a list, that works to bc that is where I am on any given day. Grief and loss is such a long process, very long, much longer than I ever imagined. Thank you for always reading, and very often commenting. Yes, we all feel the "shoulds", but I hope that many now know that we don't have to live up to those. We need to be thankful for whatever we have in our life that helps. And I'm thankful for you, and all of the readers who take the time to comment and let me know that I'm not alone. I knew I needed a list of what "being ok" looks like, but I didn't have the energy or clarity to make one. I copied your list and used it as the starting point for my own. It's like a roadmap, showing me how far I've come and the few things I still need to do. Thank you so much for posting this. It gave me so much hope. I'm so glad that you found hope here. That's the only reason I write. And I'm glad that you found my list worthy enough to make a copy. I don't think we have to be grateful for all the generic things that most people list. We're in a different place. And I'm thankful that we're here together, rather than feeling all alone. Dammit Janine, why oh why do you write in here TWO DAYS BEFORE ME? You totally wrote pretty much the exact same thing I was going to write!!! (of course, im nowhere near where you are yet, but Im a hell of a lot more healed than I was at this time last year or the year before!) lol. Anyway - great list, and I usually dislike grateful lists because Im such a cynic and they always feel so forced to me lol ... this one doesnt. Love you! I'm glad that you liked the list. I figured that everyone would expect a hokey, "I'm so freaking happy" -list, but I knew this would be different. And hopefully in a good way. I love you, my friend. And am so thankful that you're finding healing. Giving thanks for SSLF and all of you...and that I have figured out how to use the snow plow here in Michigan! Sometimes it's the littlest things that matter the most. Janine, Thank you for being so real with us. It is comforting to hear from someone who has traveled the dark road before us. It does make this journey a little less scary. I recently realized that I have started to feel # 1, 2, & 3. That's been a big breakthrough for me. I never thought that would happen. I'm still working on #11, 12 & 13 and I'm happy to say when I see old couples walking together I can now smile and feel jealous but happy for them. I'm also a bit jealous of you because you are 4 years ahead of me...so much further in this journey. I can't wait to be 6 years out and Thankful:) Happy Thanksgiving! 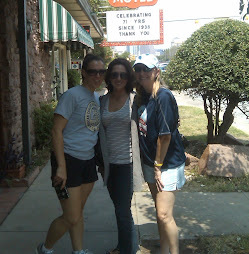 Janine, Michele, and Michelle D.
Michele, Taryn, and Michelle D.
Yes, Camp Widow is for men too! Community, laughter, hope, and no need to hide our feelings. Fabulous! 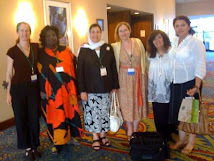 Widows from around the world.